Smithsonian wrote: After surviving the first frightening moments of the eruption, he was probably moving as fast as he could down an alleyway to flee the city when the pyroclastic flow, a high-speed tsunami of lava, ash, rock and gas rushed down the side of the mountain and slammed into Pompeii. The power of the impact is what may have propelled a giant stone block, which could be a doorjamb, onto the victim, crushing his thorax and pinning him beneath the ash for the next 2,000 years. 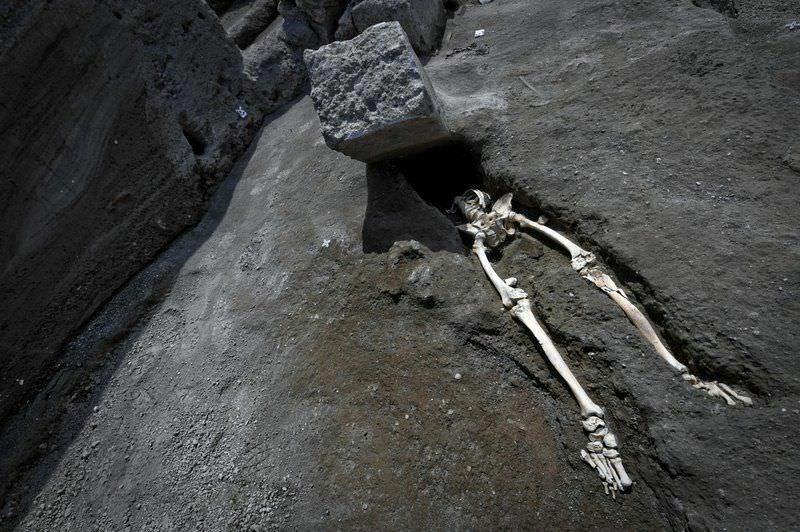 In May, archaeologists uncovered the ancient remains of a man who had been seemingly crushed by a flying boulder while fleeing from the eruption of Mount Vesuvius in 79 A.D. Only his skeletal legs and lower torso protruded from beneath the 600-pound block. At the time, the team reported that a volcanic cloud had launched a stone door jamb toward the man, decapitating him. What appeared to be the Wile E. Coyote-esque nature of the man’s final moments made him an instant, meme-worthy celebrity some 2,000 years after his death. 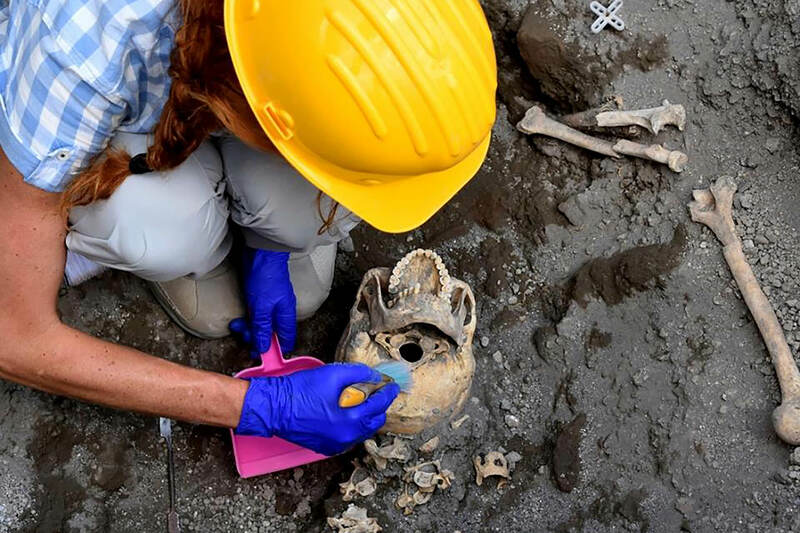 But further digging has unearthed the man’s intact skull with his mouth wide open (and full of teeth), suggesting he was not crushed by a volcanic projectile. The skull and the man’s upper torso and arms were found about three feet nearly directly below the rest of the body and the gigantic stone. The team said they knew the bones belonged to the same person because of their proximity to each other and because the two halves matched up. Those really are speed bumps on that road. Damn kids racing chariots at all hours. 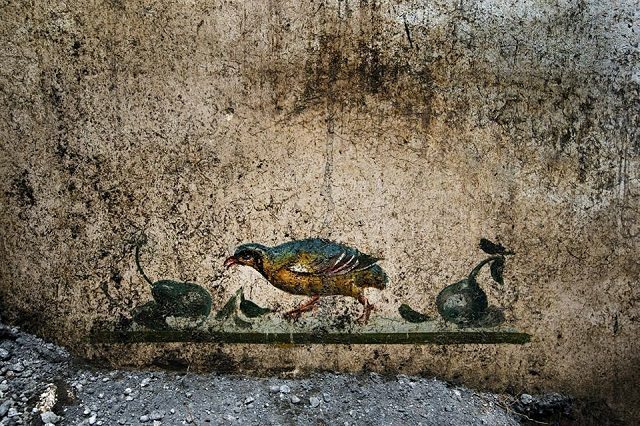 Don't know for Pompeii, but in Rome horses and carriages were only allowed around dawn to bring stuff to the markets: Romans went on foot. There were exceptions for the military, of course. The man said he had moved the tiles accidentally in an attempt to get a good photograph of the site on Wednesday. He was taking a picture at the House of the Sailor, which gets its name from the mosaic located at the entryway, which depicts six boats. The 2nd-century, two-storey building was only opened to the public for the first time in autumn 2017 after extensive restoration. Specialist restorers will reattach the parts of the mosaic that got dislodged. The House of the Sailor was uncovered in 1871 and contains a private spa and underground bakery workshop, combining aspects of traditional town houses with those of commercial warehouses. While the American's actions may not have been malicious, the site also struggles with tourists who pocket relics as holiday souvenirs or even to sell for a profit. And several thieves have sent back the loot claiming the relics are 'cursed'. 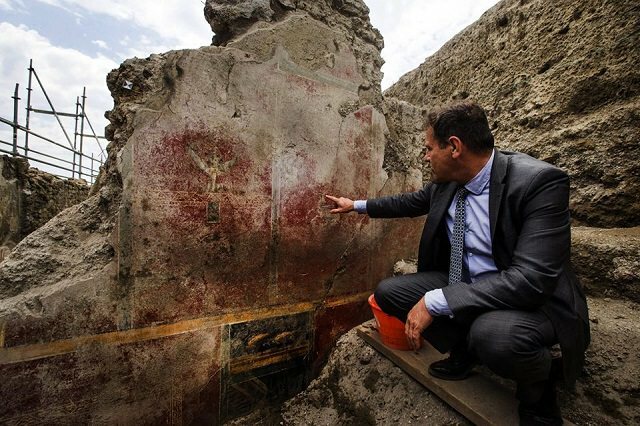 Pompeii's archaeological superintendent said in 2015 that he was considering setting up an exhibition of the returned artefacts and accompanying letters, to tell the story behind the stolen pieces.